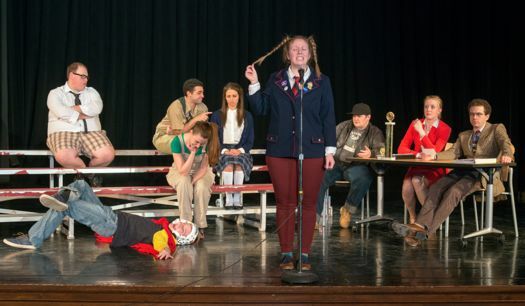 Spelling Bee closes this weekend at SLOC in Schenectady. The good news, we're pushing 51 degrees this weekend. The bad news -- gray and rainy. But hey, it's not snow. After the jump, a few thoughts on how to enjoy the weekend. Doing something that's missing from our list? Add it in the comments for everyone to see. And whatever you're up to, have a fantastic weekend. + 1st Playable is giving a tour of its game studio located in an 1800s ballroom. You can try the latest games and check out the interactive Minecraft exhibit. + Tours and kids workshops at the Tech Valley Center of Gravity. + Circus skills demonstration in Monument Square. + Collar Works on River Street is opening Robin Arnold's Botany / 808. "Inspired by botanical phenomena, from the hidden dynamics of a tiny seed to larger ecosystems." And here's the complete schedule of events. Historic Albany's Moveable Feast is this Saturday night. It's a dinner party where guests are taken to the homes of surprise hosts for a gourmet meal with other unknown dinner guests. The dinners are all sold out, but tickets to the pre and post event receptions at Albany Law School (5 pm to 6:30 pm / 8:30 pm to 10 pm) are still available for $50. The Madison is screening four films with the late Philip Seymour Hoffman this weekend: Boogie Nights, Capote, Moneyball and The Talented Mr. Ripley. Friday: The Mop & Bucket Company is back at Proctors Underground on Friday night with a new season of TheaterSports -- in which teams of improvisors compete based on audience suggestions. (Think Whose Line is it Anyway?) Friday at 8pm - $14 / $6 students and seniors. Sunday: LuÃ­sa Maita at The Sanctuary for Independent Media. Samba and swing. "The new voice of Brazil. "7 pm $15. The Albany Devils are at home this weekend with games Saturday at 5 pm and Sunday at 3 pm. The indoor butterfly house is open this weekend at miSci. An easy way to make it feel more like spring: take your umbrella and head to one of the seasonal ice cream stands. Here's the updated list of what's open. Indoor markets are open in Troy (Saturday at the Atrium), Saratoga (Saturday at the Lincoln Baths in Spa State Park), Schenectady (Sunday at Proctors), and the Spa City Farmers Market -- at the Lincoln Baths in Saratoga Springs (Sunday at the Lincoln Baths). Troy Music Hall, miSci, Saint Rose, Capital Rep and MopCo advertise on AOA. AOA is a media sponsor for the Albany All Stars. Psyched about the PSH Tribute at the Madison. Yes! Poetry & Performance Series is tonight, Saturday night, 8pm @ Albany Center Gallery. We'll feature a trio of amazing NYC artists (Ian Hatcher, Stephanie Strickland, and Jamie Townsend) working with text, image, sound, and poetry apps, painting the walls with the Word. FREE and open to the public. We'd love to see you there!